It’s December guys and gals, put on that festive hat and lets get stuck into the penultimate battle! We all know that Christmas eats do not end on the day itself, that really would be a sad situation because the Boxing Day food is just as exciting as the day itself. 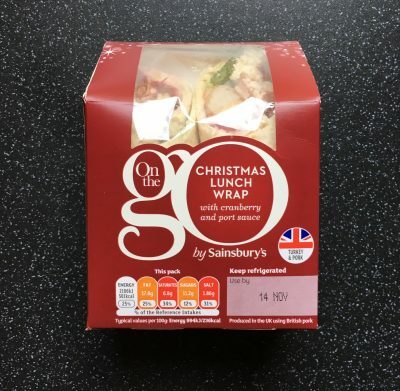 I was pleased to see that the festive sarnies this year aren’t just focusing on the turkey and stuffing, and today’s review is all about the Co-Op Boxing Day Lunch. Co-Op are covering all bases by doing both a Christmas Turkey number as well as the Boxing Day Lunch. 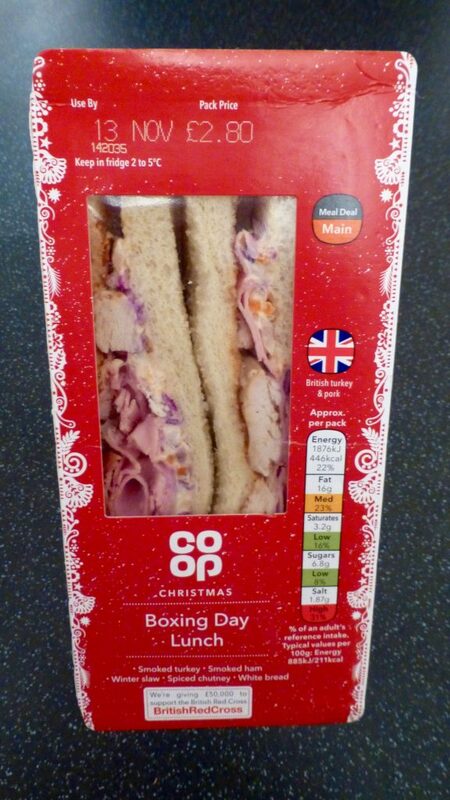 In its slightly festive packaging, it certainly stood out amongst the other sandwiches, and as you can see is part of their meal deal range and they are supporting the British Red Cross. Smoked turkey, smoked ham with winter slaw and spiced chutney in white bread. Per pack: 446 kcal, 3.2g sat fat, 6.8g sugar, 1.87g salt. Well it pretty much looks like it has been thrown in there by someone. I can never understand with most prepackaged sandwiches why the filling is so sparse and never ever reaches the edges. Why is this? I wonder if they bunch it all at the front to give the illusion of a jam packed sarnie, only to then disappoint their customer when they chow on down. Food for thought there. Despite the lack of turkey I could taste both meats. It would have however been nice to see some gammon ham in there rather than the standard everyday wafer thin ham. 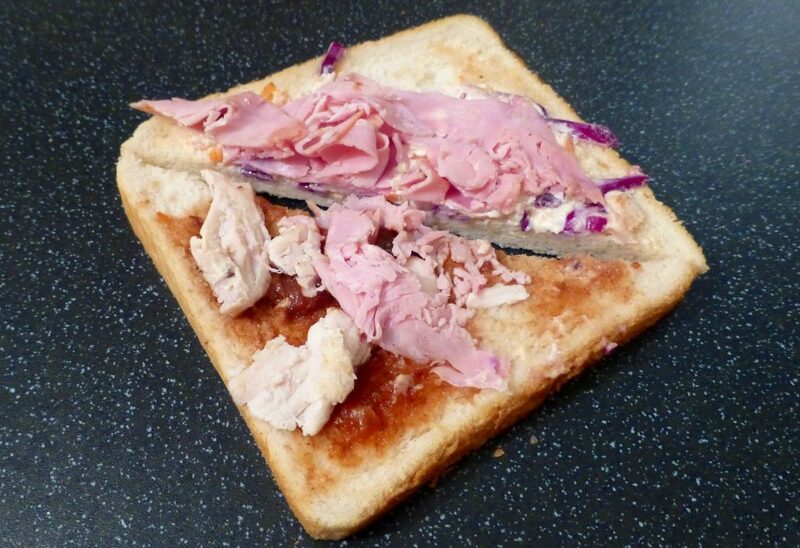 The zingy crunchy coleslaw was certainly the saving factor in it not being dry, and the chunky chutney sweetness completed the sandwich as a whole. Despite my love of malted bread, I quite enjoyed the white bread used here and thankfully there weren’t any dry crusts. The Co-Op Boxing Day Lunch isn’t a bad little number at all. I like that the Co-Op have strayed a little off key but still remained festive and captured what often is the Boxing Day Lunch in most houses. The main improvement here would be more filling to the edges please. See you all tomorrow for the final battle….